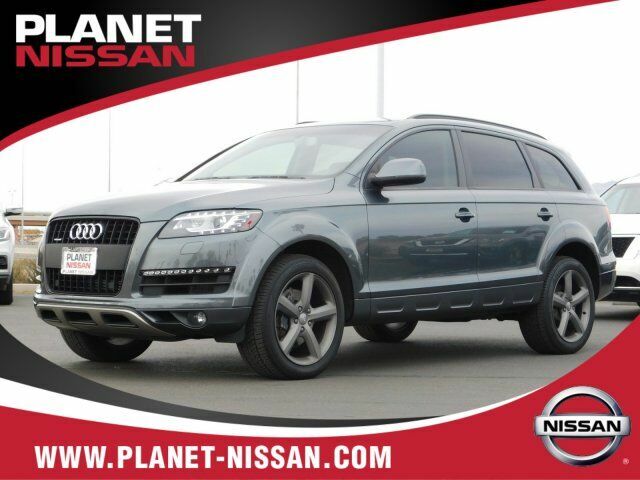 2015 Audi Q7 3.0T Premium Plus quattro CARFAX One-Owner. Clean CARFAX. Gray 3.0T Premium Plus quattro quattro 8-Speed Automatic with Tiptronic 3.0L TFSI V6 DOHC Alloy Wheels, Audio Package, Backup Camera, Bi Xenon Headlamp Package, Bluetooth, Bose High End Sound Package, Climate Package, Heat Package, Leather Seats, Navigation System, Off Road Package, ABS brakes, Audi Advanced Key, Audi Connect w/Online Services, Audi MMI Navigation Plus w/Voice Control, Audi Parking System Plus w/Rearview Camera, Audi Side Assist, Auto-Dimming Power-Folding Exterior Mirrors, Black Optic Package, Black Roof Rails, Compass, Driver Information System w/Trip Computer, Electrically Adjustable Steering Column, Electronic Stability Control, Front & Rear Acoustic Parking Sensors, Front dual zone A/C, HDD Navigation w/Voice Control, Heated door mirrors, Heated Front Bucket Seats, Heated front seats, Illuminated entry, Low tire pressure warning, Memory Function for Driver, MMI High Control Panel, Navigation System, Offroad Style Plus Package, Panoramic Sunroof, Power Liftgate, Premium Plus Package, Radio: In-Dash Single CD/DVD Player & HD Radio, Remote keyless entry, Technology Package, Towing Package, Traction control, Wheels: 9.0J x 20" Titanium 5-Spoke-Design. Recent Arrival! Odometer is 12970 miles below market average!